Deep State government bureaucrats don’t care about the poor, the hurting and the destitute. And they certainly don’t want to empower the Church to help these people or to be the hands and feet of Jesus in a hurting and broken world. They want to take away any sort of influence the Church might have … and ensure their own control over every public charity or service. And they will go so far as to attempt to destroy any Christian service that doesn’t go along with their political agenda…regardless of the cost to human lives, and the suffering it produces. Let me tell you about my friend Sam Galluci – a pastor in Oxnard. Sam hasn’t always been a pastor. At one time, he was a high-powered business executive. But he left that all behind to help pastor a church … and eventually start a homeless ministry in Ventura, California. When Sam started his ministry in 2007, there were hundreds of homeless people roaming the streets of Ventura. The city was trying to address the problem, but wasn’t making very much progress. They even created new ordinances that restricted people from distributing food or clothing in public. That’s when Sam and his church stepped in and started taking in homeless people. Calling it “Operation Embrace,” they offered their church as a sanctuary where people could get a hot meal … and hear about and experience the love of Jesus. Children were going to school again. Single mothers were getting back on their feet. The mayor of the city at the time – a Christian – was overjoyed with their progress. Here was the Church making a massive difference, seeing the Kingdom of God come. In a short time, “Operation Embrace” was feeding 60 people every day. They were seeing dozens of people get off the street permanently. And they were working with kids who had been emancipated from their parents. But their progress didn’t stop there. Eventually, “Operation Embrace” evolved into the “Kingdom Center” – a living center where homeless people could get back on their feet and reclaim their lives. Sam’s ministry was transforming the city. And he continued to have favor with the city, under a new mayor who was Jewish. Suddenly there was a feeling that your rights protected by the Constitution weren’t really “rights” anymore. 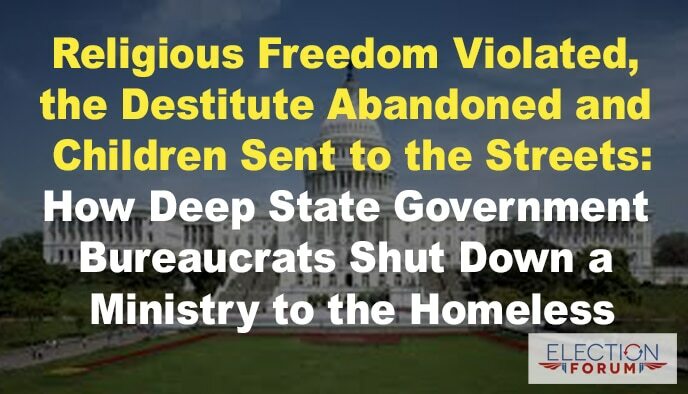 Religious freedom came under attack. And this didn’t just happen on the national level. City governments also saw new, anti-religious-freedom leaders and bureaucrats come into power. In Ventura, a new progressive mayor was elected. In just 90 days, this new mayor transformed the city council into a group with a radically progressive, anti-Christian worldview. The “Kingdom Center” came under extreme attack. Sam was told they needed to stop feeding people…stop reaching out to the poor…stop making a difference. The city then told Sam they couldn’t serve people Monday through Friday because those days were outside the bounds of “traditional” days of religious service. This is where the city radically crossed the line – they decided it was their role to define a religious practice. For them, feeding people on a Monday or a Tuesday wasn’t a religious act. The local government wanted to destroy any sort of charitable giving. They didn’t care that 300-400 hungry, destitute men, women and children were being fed every day by Sam’s ministry. They didn’t care that people’s lives were being radically transformed. What they wanted was control. They wanted to institute a government-run, government-controlled system to help solve the problem of homelessness – and restrict anyone else from helping. To prevent Sam from serving the homeless, the city council did what all bureaucrats do when they abuse their power to maintain control: they create endless rules and regulations. First, they required Sam to obtain a permit that was nearly impossible for him to attain. Then, when Sam returned to the council and told them he was willing to move – but not shut down his organization – they created 68 new conditions for him to meet. He was devastated … but the worst was still to come. In April of 2014, the police showed up at the doors of “Kingdom Center” and shut it down forcibly. They turned away 120 homeless kids at the doors because Ventura’s law enforcement decided they could no longer receive free care and aid from Sam’s ministry. With his ministry back down to 40 people – losing 100’s in the legal turmoil – Sam went to federal court with his case. He was brought before a judicial activist – a judge who abused his power to legislate his own ideological agenda. This radical judicial activist decided that he had the power to interpret the Bible. In other words, now it was the responsibility of the city – not the Church – to decide what constitutes Christianity … and for this judge, Christianity did not include caring for the poor. With the help of the Religious Liberty Council of Stanford and other churches, Sam won by appealing to the U.S. Court of Appeals for the 9th Circuit. Finally, the “Kingdom Center” won in court. The ruling against Sam’s ministry was so outrageous that he received a unanimous decision defending him. Sam finally got victory, but the crisis had caused a lot of damage. Sam continues to serve “the least of these,” ministering to a massive community of migrant workers. He learned a powerful lesson from his battle with the city of Ventura. “When the Constitution is attacked, everyone is attacked,” says Sam. A few radically progressive City Council members and judges decided that Sam’s ministry could no longer exercise freedom of religion – the freedom to practice their faith in God by serving the poor. In fact, they spent over $5 million to fight Sam’s homeless ministry – $5 million funneled out of taxpayer dollars. By the grace of God, Sam emerged victorious. But the hypocrisy and absurdity of his story are disturbing indicators of an increase in religious persecution in this country. It’s also a powerful reminder of what happens when the Constitution is trampled on by radically progressive ideologues. Everyone loses. People are not cared for. The Church cannot do its job. Taxpayers lose. And society loses. The politically-motivated, power-hungry City Council and judges who tried to destroy Sam’s ministry are part of the Deep State. In my new book – The Deep State: 15 Surprising Dangers You Should Know – I reveal more stories like my friend Sam’s. You’ll discover horrific stories of Christians being persecuted and attacked by Deep State-fueled bureaucrats, judges and politicians. You’ll discover how First Amendment rights are being strategically targeted and destroyed in this country…and how you can defend yourself. What do you think about Sam’s story? Email me at [email protected]. Yes, another example of those who want no God and no Constitution – they exalt self. The ultimate enemy is self-centeredness. God created our physical bodies separate from Himself, but He placed His Spirit within us in the womb. Once we leave the womb, the “corrupt” world around us begins to shape us. For more and more people there has been a decrease in “spiritual” nurture and an increase in “fleshly”/ego nurture. We become what we have taken in, physically and spiritually. This has, of course, led to the increase of exalting “self” rather than God. Our founders declared that certain rights (Life, Liberty, e.g.) were inalienable, were ‘endowed by our Creator”, not government. Therefore government cannot deny them. Yet, presently government denies both Life and Liberty for all. The Constitution was written to preserve Life and Liberty for all. The present effor in our society is to preserve the evil of “self-centeredness” by destroying the Constitution and God. The Constitution may get shredded, but God won’t. Self-centeredness is ultimately self-destructive. Those who stand steadfast with God’s covenant may die to this world, but will enjoy eternal life. Extend God’s mercy and truth (not one or the other) to those around you, praying that they will decide to accept God’s salvation. Then we might have some hope for preserving the Constitution. Those of us who stand with God must (as citizen’s of this earthly kingdom) must determine before we vote, which candidates also stand with God and our Constitution. If a tsunami were to hit the city of Ventura, they would be more than happy to get any kind of help or assistance from a ministry like the “The Kingdom Center” or “Operation Blessing”…It’s funny how atheists bad mouth Christianity yet they are in the lines getting food from the Christians.